What if there is good reason to believe the greatest risks of climate change lie beyond 2050? This question is asked in a comment in the medical journal The Lancet by Professor Alistair Woodward, Head of Epidemiology and Biostatistics at the University of Auckland in New Zealand and Professor John R. Porter from Department of Plant and Environmental Sciences at University of Copenhagen. A scientific article by Springmann and colleagues published by The Lancet report the most advanced projections so far of the effects of climate change on food and health for 155 regions in the year 2050. The headline is that climate change will slow progress, cutting the anticipated improvement in food availability by about a third, and that these changes will be associated with about 529000 additional deaths in 2050. Professor John R. Porter from Department of Plant and Environmental Sciences at University of Copenhagen. The two professors give some examples of extreme, but not implausible, effects on food production beyond 2050. Moderate-to-heavy-intensity work outdoors, as is necessary for agriculture, will more likely than not be physiologically impossible during the hottest month of the year in northern India in the early part of next century. And failure of the rice crop in southern China due to high temperature stress can change from a 1 in more-than-100-year event to become a 1 in 10-year event under a scenario of 2–3 °C global warming and a 1 in 4-year event in the case of 5–6°C global warming. They also point out governments are familiar with the need to plan for worst-case scenarios, for example, terrorist attacks – and the same level of preparedness must apply to climate change. Alistair Woodward and John R. Porter also comment on the agreement made by the governments in December 2015 in Paris, where they for the first time decided on an international response to climate change—one that includes nearly every country and accepts the need to hold warming by 2100 to 2°C above pre-industrial levels, and if possible to no more than 1·5°C above these levels. The governments agreed that global emissions will peak ‘as soon as possible’ and then fall rapidly to reach zero net emissions in the second half of this century. “To achieve such ambitious goals, the world must make radical changes in the use of energy. Without due care, responses to climate change could have greater effects, in the short term, than climate change itself. Fossil energy is a major input into food production through nitrogen fertilizer and irrigation, and to find ways of reducing emissions without damaging health will be a challenge. Expanded use of biofuels might compete with food crops, carbon pricing regimes could aggravate food insecurity in the poorest populations, and culling of livestock to control methane emissions might be detrimental unless alternative sources of protein, energy, and nutrients are available. Springmann and colleagues have moved the climate and food debate in a necessary direction by highlighting both food and nutritional security, but a mountain of policy-relevant questions remains that require close scrutiny,” Alistair Woodward and John R. Porter conclude. The Lancet is a medical journal with an Impact Factor of 45.217. See the article ‘Global and regional health effects of future food production under climate change: a modelling study’ by Springmann et al. here. See the comment ‘Food, hunger, health, and climate change’ by Alistair Woodward and John R Porter here. 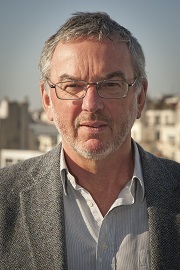 John R. Porter was in charge of the IPCC chapter on food security in the last Intergovernmental Panel on Climate Change (IPCC) report in 2014 that formed the scientific bedrock of the COP21 agreement in Paris in December 2015. According to the IPCC, the effects of climate change on food security could be some of the most serious in the near-tomedium term, especially if global mean temperature increases by 3–4°C or more. John R. Porteris part of the Copenhagen Plant Science Centre with focus on plant biology and plant biotechnology. It is a center under Department of Plant and Environmental Sciences at University of Copenhagen. Read more about Copenhagen Plant Science Centre here.